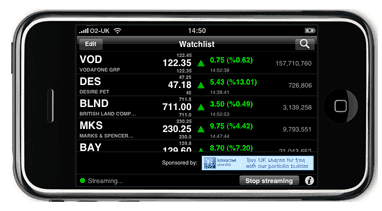 Shareprice has released on the UK iTunes app store the first approved native iPhone application to integrate with Lightstreamer in order to stream prices between the ‘market’ and the iPhone. According to the Shareprice site, the real-time data originated from London Stock Echange will stay free until next release, when they plan to charge £4 per month to ensure their users get a dedicated stream and they can grow to meet demand. A video capture demo of Shareprice is available. Evaluation Licenses Extended to 60 Days!